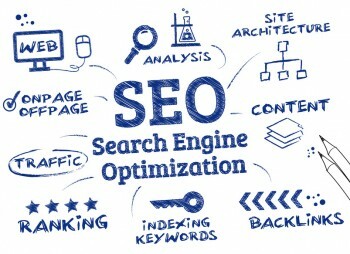 SEO is an abbreviation for (Search Engine Optimization). It is the process that involves optimizing your website for certain high traffic keywords that you would like to appear on the first page of Google for. SEO is a multi step process which involves optimizing your website along with a few other factors to properly influence search engines to properly rank your website. Read more about the few things that are important to building a properly optimized SEO driven website. Onpage: The content on your website needs to be unique and relevant to what the user is searching for. Search engines look at user engagement, if you have a high bounce rate that usually indicates that you are not giving your visitors what they are looking for and that can be classified as low quality content. Onpage Optimization: Not only do you need to maintain quality content to ensure your visitors are getting what they need, you also need to ensure that everything is optimized for search engines. Utilizing proper meta tags along with using a proper percentage of anchor text diversity is key in onpage optimization. Offpage Optimization: Another key component in SEO is offpage optimization. This usually pertains to the amount of sites that are linking into your site and the type of anchor texts that are used. Proper anchor text diversity along with diversifying your backlink sources ensure you comply with all search engines and not put yourself at risk of a possible penalty. Connect with me to discuss your SEO campaign. I would be happy to review your website along with the potential keywords you would like to appear on the first page of Google for.